So, after coming across this Book Beginnings on my daily blog reading I have decided to start doing this every Friday. Book Beginnings is hosted by Rose City Reader. She invites you to share the first sentence or so of your current read and share your thoughts about the sentence, initial impressions of the book and anything else it inspires. I am also going to be taking part on Friday 56 hosted by Fredas Voice. This is where you grab the book you are reading, turn to page 56 (or 56% on your ereader) and post a few sentences. I'm looking forward to taking part in both on a regular basis. 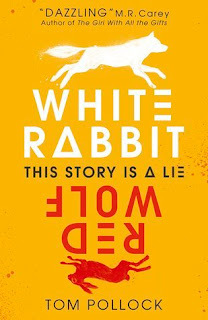 I am currently reading....a proof copy of White Rabbit, Red Wolf by Tom Pollock. "Mum finds me in the larder. I crouch in the corner, flinching from the sudden light in the doorway. My mouth is full of blood and shards of porcelain." Just from the opening sentence I can tell immediately that this book is going to have some element of mental health issues. It also intrigues as to why the MC's mouth is full of porcelain. It doesn't, however give me any clue as to what the plot is going to be about and that's good because I like a little mystery. "I tail off, breathless. Shut up, Peter. Listen to yourself; you're wired up and paranoid. I stare at her, willing her to deny it so I can let go and trust her. I can't do this by myself. She'll explain, she will. She'll set me right. She'll help me." I'm only about 100 or so pages into this book and I'll admit from the first few chapters I wasn't sure if I was going to like it. However, the pace seems to have picked up a bit and I am beginning to follow the plot. I am looking forward to seeing how it develops. Ooh I have this on my TBR! I picked it up at NYA Lit Fest and it sounds intriguing. That first line makes me cringe a bit though, at the imagery. Sounds intense but I like that! :-) Happy weekend! So glad you joined in! That's some opening. I've not heard of this book and now I'm curious. 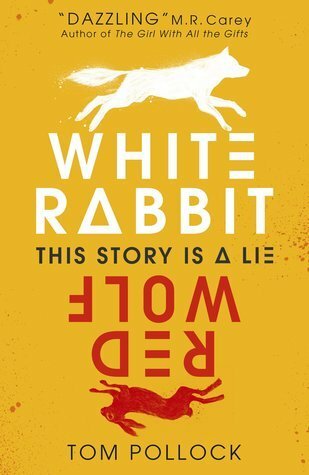 I think I'm going to add this to my tbr. Thanks for sharing!